courtesy of the city of eureka. 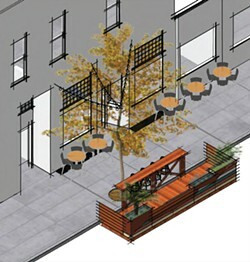 A rendering of a proposed parklet for A Taste of bim. the restaurant and city are finalizing designs. Soon you'll be able to park it right in front of Ramone's in Old Town and enjoy a glass of wine. Not in your car, but in an outdoor seating area that bumps out into the street. Four restaurants are nearly set to build parklets — small public spaces that will occupy one parking space across the sidewalk from the business' front doors. The miniature hangouts have caught on in hip neighborhoods around the country, and the idea of installing them in Eureka has been forming for at least a year. When designs are finalized and permits are issued, people will be able to sit outside in front of the Siren's Song Tavern, Ramone's Bakery, the Humboldt Bay Tourism Center, and A Taste of Bim, a soon-to-be-opened restaurant in the old Avalon building. The parklets will be a sort of public/private venture: The businesses will pay the costs to design, build and maintain them in return for help with city permits. The parks are technically public — people won't be required to purchase anything to use them, but studies indicate that similar programs benefit the businesses regardless. The pilot project will run for 18 months, during which the city's various oversight commissions will analyze the benefits and costs of the little public spaces. If the idea catches on, the city could maintain or expand the program. If it's a bust, the businesses will be responsible for removing the parklets. Community Development Director Rob Holmlund said he began to develop the pilot program as he met with more than 100 community members in the year since he's taken his position with the city. In his lunchtime conversations with business owners, developers and other influential Eurekans, Holmlund said he's consistently been told Old Town and other commercial areas need to be "more vibrant." To that end, the city's considering a number of changes, including allowing restaurants to serve alcohol in outdoor seating areas, principally permitting more types of businesses in the Old Town area and loosening its food truck ordinance. Allowing restaurants to serve alcohol outdoors — which will go before the city council soon — could be crucial to the success of the parklets program. Siren's Song Tavern and the Tourism Center sell a wide variety of beers and wines, and Ramones Bakery owner Berit Meyer said she's seeking a license to sell beer and wine soon as well. Café Nooner, one of the few Old Town businesses that offer outdoor seating, sells beer and wine, but can't serve it in the sunny outdoor tables in Opera Alley. While it's just one of many ideas circulating to revitalize Old Town, the parklet program will be an eye-catching change to the city's streets, and one that many feel will be successful. Parklets aren't a new concept — cities large and small around the country have been installing the public spaces for some time, and multiple websites offer advice to businesses and municipalities seeking to build parklets. A survey of businesses in Philadelphia found an average 20 percent increase in sales for businesses with parklets, and both Holmlund and city Council Member Natalie Arroyo said the projects have been shown to boost sales for neighboring businesses as well. Parklets stand out on a block, make neighborhoods more attractive and increase interest in businesses, Arroyo said. But that doesn't mean community members haven't expressed concerns, primarily in letters and comments on other reports about the city's proposed project. Chief among those seems to be worries that the homeless will take over the parklets, turning them into vagrant wastelands, or that the small public areas will attract more homeless into the area. 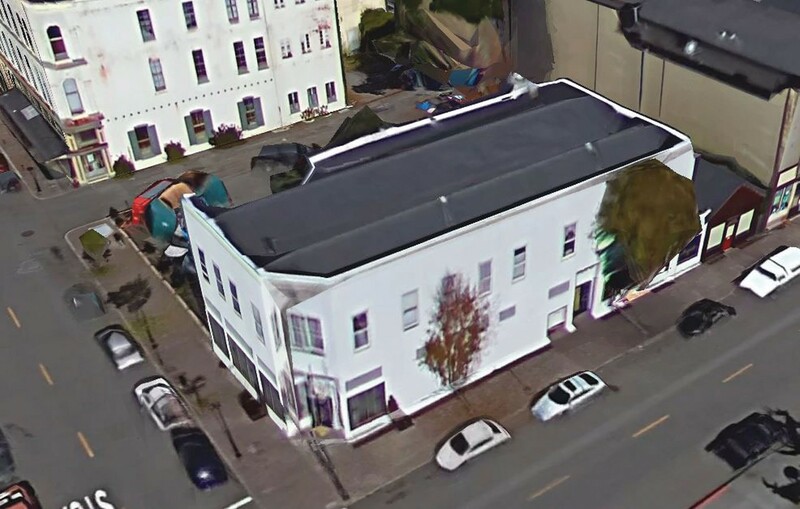 Kelly Martin, a Eureka-born developer who owns the buildings that house the Humboldt Bay Tourism Center and the upcoming A Taste of Bim, said he understands the concern — operating a business in Old Town means dealing with people with drug addictions and mental health issues at times. Taking a quick break from tiling a floor, Martin recently said he thinks the public/private nature of the parklets will help prevent loitering and damage. Businesses will take on the costs of maintenance and repairs and employees of the participating businesses will be able to police the areas for bad behavior, to a certain extent. "There are many other communities who've allowed parklets that have a significant homeless population," Arroyo said, and she doesn't think Eureka's ongoing struggle with homeless issues is a reason not to try the pilot program. Apparently, the rest of the council agrees, as the members unanimously approved the project last month. Meyer is willing to take on the cost of cleaning up the parklets if they're abused overnight. She said their designs don't include benches long enough to sleep on. "We'd like it if people could hang out and keep Old Town more user friendly after hours," she said. Another apparent concern is the loss of street parking, but while members of the public have complained about a lack of parking in Old Town, everyone involved with the parklets that the Journal spoke with said parking isn't an issue. Martin said he sat on a committee several years ago that found there was no lack of parking in the area. That's apparent, he said, in the 40 empty storefronts he's counted in the area. "If we had a parking problem, these small businesses would be thriving," he said. "I can't wait for the day when we really truly have a parking problem." Meyer said she hears complaints from customers about parking at the café's Harrison location, but rarely about Old Town. "Whenever I go to Old Town, I always find parking within a block," she said. Arroyo and Holmlund relayed the same anecdote. "I think parking is an important aspect, but when you drive on the street I don't think it's very pleasing to see a long line of cars," Arroyo said. "It keeps businesses from being seen. Having parklets is a really cool way to reclaim streets and to make Old Town more safe. "Holmlund estimated there could be more than 1,000 parking spaces in Old Town. "Even if there were a parking problem, the number of spaces being lost isn't enough to make an impact." Still, he said, he would support another study if there was enough concern about it. With plans submitted, the city is working with the parklet proposers to issue encroachment permits. The businesses still need to secure liability insurance, and city staff needs to review the plans to make sure they're safe, structurally sound and provide for proper water flow along curbs. Martin said some details about the plans are still being worked out, including landscaping, lighting and possible heaters for evenings and colder months of the year. Holmlund said he thinks the parklets could be built by the end of this month. "As far as I know, this has been successful everywhere it's been implemented," he said. The pilot project will allow the city to identify problems and successes, and refine an ordinance for possible expansion of the program in future years. Other cities have expanded parklets to cover an entire block. "There's a lot of places we could go with this," he said. "It's another opportunity for Eureka to become a really cool place to be."